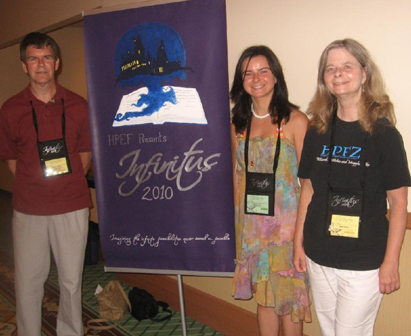 A report on Infinitus 2010, July 15-18 2010, by David and Toni Gras of Harry Potter Fan Zone. The four days of Infinitus took place at the Royal Pacific Hotel, one of three hotels on the Universal Resort complex. Surrounded by a lush, tropical, Polynesian background made one think we were in the midst of Hawaii! What made this conference unique is that the Lowe’s hotel group gave us one entire building for the conference, set apart from the rest of the hotel (are they trying to tell us something?!) so no bumping into Muggles around every corner while riding elevators, taking staircases, etc. as has been the case in past conferences. This time all 2,400 fans who attended Infinitus (yes, their largest group ever!) attended the conference just a few steps from the pool, boat ride to Universal and the ever-popular Sushi bar in the hotel (frequented by the likes of some popular Potter stars – they whom-will-not-be-mentioned (until later!). As conference attendees poured in to register on Thursday, July 18 (and some as early as Wednesday, July 17), one could feel the excitement in the air. Friends sought out friends from past conferences and Potter events, new friends were made, and the camaraderie experienced was ever-present as robes strolled past creating welcoming breezes. The Opening Feast took place on Thursday in the main ballroom and these reporters were amazed upon seeing SO MANY people in attendance. The Dean of Harry Potter scholars himself, John Granger, who amazed his crowds and ran out of books after his first talk. Hogshead webmaster and author, Travis Prinzi, who made many special appearances with individual talks, panel discussions and podcasts (and this time, many were lucky enough to meet his charming wife and daughter). Pepperdine University Professor, James Thomas, one of the Potter Pundits, who kept their audience “spellbound” for two hours during their panel discussion. Author Connie Neal who held her audiences captive during her lectures. Equally enthralling were other personalities and events such as Andrew Slack of the Harry Potter Alliance, known as the recipient of a large donation for humanitarian ventures, Wizard Wrock groups, and Harry Potter fan websites. Even the Gras family had our own little talk on our involvement down through the years with Potterdom and David, in fact, presented his own panel discussion group entitled Harry Potter: The Symbol of the Infinite Power of Courage and Love. Familiar names were present for talks such as Henry Jenkins, Heidi Tandy, Gwendolyn Grace and Denise Roper and some new to the conference scene such as Dr. Vicki McKinley who presented a talk on Traveling Britain with Harry Potter with Beyond Boundaries Travel (HP Fan Trips) as their sponsor, as well as sponsor of the tours that the International Quidditch Association (IQA) presented. IQA also conducted the games outdoors – to quote all-star Quidditch player, Dr. Garreth Fisher, “It was sure hot – but boy we had fun”! Wizard Chess was also available for those brave enough to weather the hot weather outside wearing their robes! For those who-could-not-be-named before, we shall now reveal who they are – none other than Chris Rankin (Percy Weasley) and Christian Coulson (Tom Riddle in Chamber of Secrets). We were lucky enough to interview both Chris and Christian, watch for those interviews exclusively on Harry Potter Fan Zone! Keynote luncheon topics included Fanfic-Trained Writers which presented professional fanfic writers such as Naomi Novik and Sarah Rees Brennan, moderated by Peg Kerr. Saturday’s keynote luncheon was Electronic Arts’ (EA) scoop on video games with Kelvin Tuite and Brendan Docherty, moderated by Charles Ardai. 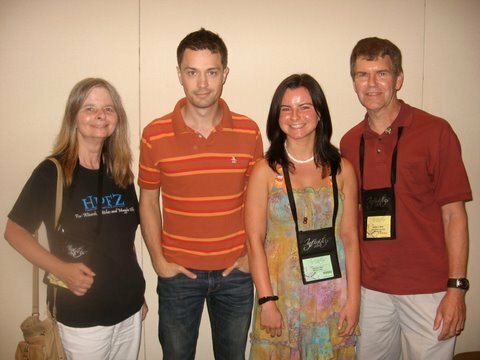 A special “Dessert” evening with both Chris Rankin and Christian Coulson was a popular destination for many. Autograph sessions with Chris and Christian occurred a few times as well as with authors that were present at the conference. BIG events (so popular the lines went around the entire conference center) were the musical “The Final Battle”, the film spoof “Harry Putter and the Ridiculous Premise” and “A Very Potter Musical Sequel Premier with Team StarKid”. HPEF sponsored a magical Friday night in Universal Studios Islands of Adventure just for conference attendees called “A Night of a Thousand Wizards” which included special after-hours access to the Wizarding World of Harry Potter. Attendees witnessed a movie about the behind-the-scenes production of the park, and the three rides in the park open and running until 1:30 AM. The Three Broomsticks and Hogshead pub served Butterbeer and desserts and shops such as Olivanders and Honeydukes were open for viewing. More on this in our Wizarding World of Harry Potter article. The Night of Frivolity Ball on Saturday night was splendid and started out with formal old English style ballroom dancing which many enjoyed and did not want to see end. Potions flowed from the bar and photographers, both professional and amateur, took photos of everyone dressed in their ball-best. The center doors of the ballroom magically opened to reveal a twice-as-large area for dancing and casual dining until long after the bewitching hour. The creators, innovators and real workers of this conference were amazing – a huge round of applause to Azisa, Jenn, Darcy, Niki, Heidi, Lindsay and Robin – you and others did a spectacular job! A toast of Hogshead Brew to each of you! With so many activities to choose from, it is no wonder that one does not attend a Harry Potter conference to get caught up on their rest! But the excitement and thrill that permeates these conferences only goes to prove how popular Harry Potter still is – perhaps that spell will linger on and on – perhaps infinitely – at least until ASCENDIO July 12-15, 2012 in Orlando!